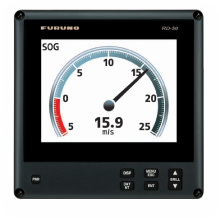 The RD50 is an 8.4” Color LCD remote display unit that displays a wide variety of data from onboard sensors. The RD50 has 3 display modes: digital, analog and graph. Up to 10 displays can be connected with a daisy chain cable. The display brilliance of all units connected in this way can be centrally controlled from 1 dimmer controller. The RD50 can be mounted on the overhead console, as well as on the desktop. It comes with an optional bracket for desktop mounting. You can even installed outside with the optional waterproof pod.